Effective and efficient data management systems and the standardization of operational procedures become increasingly important for successful project management, the transparency and sustainability of results, and the durability of investments. In this respect, software plays an ever more important role. Suitable and tailor-made databases and data systems turn out to be a precondition not only for pure data but for technically and financially systematized information which are required on the spot and can be spatialized and visualized through GIS/mapping. For this reason, GFA Consulting Group, together with GFA B.I.S. and Dr. Schindler Geo Consult International (GCI), has developed Triple I. 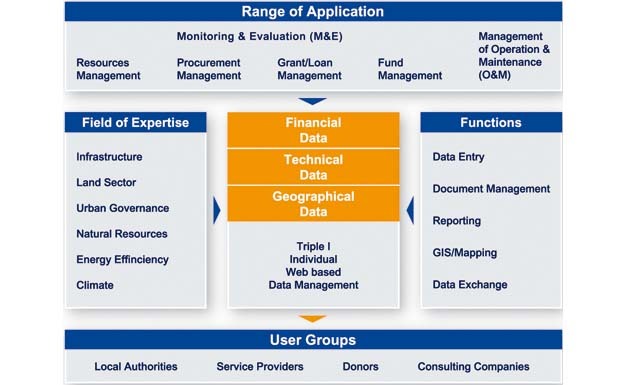 As an efficient data management system, it covers various aspects of monitoring and evaluation (M&E) as well as operation and maintenance (O&M) which can be applied in various fields of expertise and can easily be adapted to specific user demands. Due to this flexibility, Triple I provides an excellent management device for sustaining effectiveness, efficiency and sustainability. 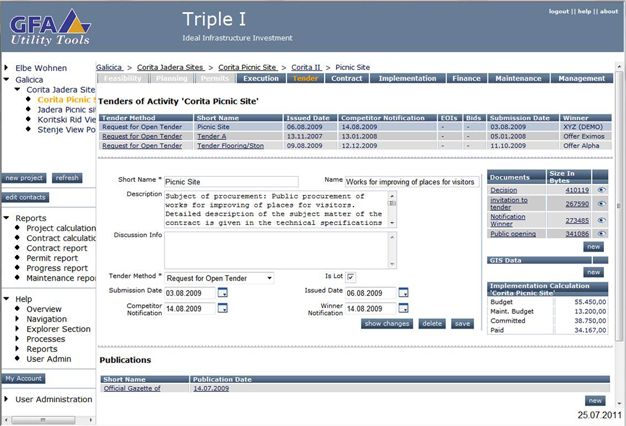 The tool provides the user with an efficient system to monitor, document and visualize data, and builds a suitable basis for the monitoring and evaluation of projects and investments as well as future maintenance and operation. Thanks to its basic and modular design, Triple I can be customized to fit individual workflows and specific demands of potential users in a very short time. Featuring individual processes, the user is guided through all workflow phases and steps. Aside from pure input of technical, financial and spatial information all relevant documents (papers, tables, presentations, plans, maps, and photos) can be uploaded, and individual explanations at each step can be added. External data can also be integrated through interfaces. The web-based software package has an integrated database that can be flexibly customized and scaled freely to local PC, Intranet or Internet hosting. Open source components with no license costs, fast implementation, and low maintenance costs complement the product’s features. Support and maintenance can be provided by local IT experts or via remote access by GFA B.I.S. The optional hosting of the software at GFA B.I.S enables the use of Triple I without any additional hardware or installation cost.